Using aluminum alloys for automotive components could reduce vehicle body structure weight and using these alloys is receiving much attention. Magnetic pulse technology (MPT) (forming/welding) is a high-speed metal processing technology which uses electromagnetic force to form or weld various materials, and is especially good for aluminum and copper alloys that have a high electrical conductivity. FOURIN is going to introduce Bmax (France) company here. Bmax develops and provides MPT in several industrial areas. 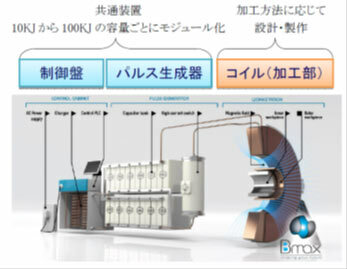 They aim is to provide total production systems using MPT for the Japanese and Asian markets as well as IHI collaboration with Bmax in the Japanese market from 2015. In the present interview, I heard about the outline of technology and the possibility of future development in automobile production process. MPT is a high-speed metal process in which the forming speed can be reached of 10-50 times higher than conventional press machine speed. Although the principle was known for a long time, it has not been put into commercial applications, the reason being that it was difficult to find an optimum condition that enables to form or to weld in reality. However, Bmax successfully succeeded in commercializing MPT by developing simulation programming code in LS-Dyna. Bmax machines can be used for several processing methods such as welding and forming by designing different coil types. Magnetic pulse welding is a cold solid state welding process which can produce atomic bonding of two metals at room temperature. The impact angle (the gap between materials before welding) and the impact speed are important parameters, and when these parameters are satisfied under certain conditions, bonding occurs. The bonding surface is very smooth and the bond strength is higher than of the base metal. Magnetic Pulse Forming has the same principle as joining, except that the impact speed is lower than in welding and the accelerated metal impacts the die. High-speed forming can also be carried out in water, using pulse power discharge. In this case, a shock wave produced by discharge and which can push the metal against a die and form it. Higher formability and lower spring back of the metal can be achieved by this technology. This technology can also be used in combination with a conventional press. It can also be used to produce sharp edges and fine shapes that could not be realized using conventional press machine. In addition, magnetic pulse crimping can be used for cable crimping with lower electrical resistance and higher joint surface ratio. MPT has already been adopted in the automobile production line. Two character lines were formed by MPT on an Aluminum hood of the Lamborghini Huracan in 2014. MPT is used in some other factories for welding of automotive HVAC parts or fuel filters. No heat effect is a very good advantage of this process compared to conventional welding processes. In addition, wire harness manufacturers are preparing to introduce MPT for mass production in the near future. MPT demand is expected to increase due to its advantages, such as lower cost and higher quality products. 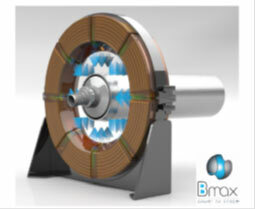 Bmax is a world-pioneer company in pulse power systems and its application such as Magnetic Pulse Welding(MPW) and Magnetic Pulse Forming (MPF). Bmax established in 2011 and is headquartered in France Toulouse. Bmax is promoting product development mainly in Europe and North America in cooperation with automobile manufacturers and others companies. Especially in Europe there is a higher request for using aluminum alloys for car production so MPW and MPF can give a good solution for Al forming and welding. There are two main base technologies in Bmax. MPW and MPF are a high speed metal processing technology. I-Pulse (Bmax Group Company) provide unique technologies with professional engineering and simulation support for a wide range of applications in the mining and automobile industries. IHI has entered into a collaboration agreement with Bmax (France) in May 2015 and engaged in activities focusing on market development in Japan and Asia. IHI with Bmax support opened a demonstration site at the IHI Yokohama Plant and invited customers who wanted to actually see processing by MPT. IHI mainly operates in four areas. « Resources · Energy · Environment », « Industrial Systems · General-purpose Machines », « Aerospace · Defense », « Social Infrastructure · Ocean ». IHI Logistics Industry System company (ILM) belongs to « industrial system · general purpose machines » of IHI group. In this company, ILM handle large presses for the automobile industry, calendar machines for making laminated rubber for tires, etc, and for logistics systems ILM handle transportation warehouse, clean warehouse for factory, FA (Factory Automation) etc. Two divisions of industrial machinery and logistics systems have been working together since 2016, ILM have become able to provide press shops, necessary for car body production for automobile manufacturers. ILM is aiming to start a business to provide a complete automated system for customers in Japan and Asia, based on MPW and MPF technology, which is provided by Bmax. Currently, ILM and Bmax can carry out feasibility tests and sample preparation in their IHI demo site. What is Magnetic Pulse Technology (MPT)? MPT is a high speed metal processing technology that accelerates metal at high speed using electromagnetic force. MPF’s speed is approximately 10 to 50 times higher than that of conventional press machines. The principle of this technology has been known for a long time and many papers have been published since 1960s. However, it has taken took a long time to be used commercially, due to difficulty in finding optimum conditions for welding and forming of the material. Further also, it was difficult to downsize the equipment necessary for MPT, such as capacitor banks and power switches to make them suitable for commercial use. The situation has been changed by the evolution of simulation and electrical pulse power components technology in recent years. Bmax also uses 2D&3D simulation software (LS -Dyna) to obtain welding windows for material pairs and predict material forming behavior during high speed forming. The time duration of the current pulse in an MPT system is very short, which is much like in thunderstorms, in nature, slow charging and fast discharge. By using several coil shapes, Bmax systems can adapt to perform different kinds of processing, such as welding, forming and crimping. Similar control panels and pulse generators may be used for all those applications. The pulse generator is a modular structure with capacity that can be varied from 10 KJ to 1MJ depending on the particular application. For example, an inner part and an outer tube material are set inside the donut-shaped coil device. When the capacitor bank energy rapidly discharges through to the coil, a large magnetic field is generated. According to Fleming’s rule, the outer tube material is accelerated by a large magnetic force and impacts with the inner part at high speed. Depending on the collision pressure and the angle of impact, the outer tube material and the inner part material may be welded. A cold solid state weld is produced similar to the explosive welding process and a wavy interface structure between two materials can result. It is possible to achieve dissimilar material bond with a high bonding strength, without heat affected zone. The impact angle (related to the gap between materials) and the impact speed are important parameters. When these two parameters are within the material welding window, bonding occurs. As you can see in below figure, the collision point moves from left to right and when impact angles and speed become appropriate, the welding can be initiated. Due to the high collision speed, the interface metal enters the viscoplasticity phase and metals behave as liquid, and bond together at the atomic level. 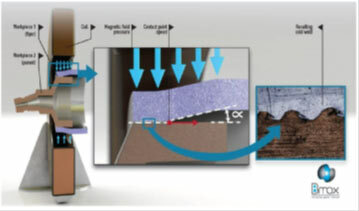 During the high speed impact, metal jets are also generated at the collision point, and by this method the contaminated layer on the material surface is removed and as a result the base materials are bonded to each other. Therefore, pre-cleaning of the material before welding is unnecessary. When the charging voltage is set on the control panel and the switch is operated, discharge begins. Charging time is about 2 to 5 seconds, depending on the charging value. If the machine is set to the auto mode, the current is released automatically after the charge is completed and the welding process is performed. At the moment of discharge, there is a sharp sound similar to a gun firing, but it is at a level that can be endured even if a person does not block his ears. The material after bonding can be touched by hand immediately, it is slightly higher than body temperature. This slight heat is due to the electrical resistance of the metal and Joule heating. The bonding surface is very smooth and has a good shape and the bonding strength is higher than the base material in most cases. The tube and vessel welded components have very good air and gas tightness, as proven by a high pressure burst test. MPW can be used for different shapes of parts such as flat and sheet. Different material combinations can also be joined. However, Aluminum and Copper with high conductivity are particularly suitable. The principle of Magnetic Pulse Forming (MPF) is the same in terms of using electromagnetic force. However, impact speed is different and metal impacts with the die. It is often doubtful that the material will be joined directly to the die during molding, but in the case of forming, the collision speed and the forming conditions can be simulated to find the optimum forming condition. The advantages of MPF are greater formability, sharp edges, fine shapes, and minimal spring back of materials. Another merit of MPF is that the system can be combined with a conventional press system. For example, it is possible to form a large part first with a conventional press, thereafter apply MPF processing to reach a sharper edge or correct strain in a part, after press forming. There are two kinds of forming methods: (1) direct forming; in which the metal to be formed collides with the metal die at high speed directly due to the applied high magnetic field (2) Electro-Hydraulic Forming (EHF); in which we apply electrode discharge in water, to propagate a shock wave and push the metal against the die. EHF can be used for harder material such as stainless steel, Inconel and Titanium which have lower conductivity and which are less suitable for MPF. In direct MPF, the size of material that can be processed due to coil size restrictions and is limited to about 600cm2.But in the case of EHF, the forming size can be up to several square meters. During the EHF process, a multi-pulse mode can be applied for high deep forming. Airbus Helicopters (France) are actually using an EHF process for forming of a helicopter’s oil deflector. The material is initially aluminum A6061T0, which has in the past been conventionally formed in several steps: (1) Press forming (1st step) → 2) Press forming (2nd step) → 3) Heat treatment (change temper from T0 to T4) → 4) Press forming (correction) → 5) finalizing the forming. In the conventional method, 5 steps were required to form this part, however, by using EHF, an aluminum A6061 T4 as a blank material, can be formed in only one step. The EHF process requires a single-sided die only to form such complicated parts. There is also a method called indirect MPF. In this method, which is suitable for the forming of stainless steel or steel (or other materials that have low electrical conductivity) an aluminum plate can be used as a pusher. The pusher will be placed between the coil and blank material and the induced current on the aluminum pushes the steel against the die. However, this indirect forming needs extra materials and the merit in the forming process is less than the other two methods. Magnetic Pulse Crimping (MPC) is different from welding and metals are not in metallurgical contact with one another and are in mechanical contact only. For example, outer parts can be formed into the groove of the inner part and crimped to each other strongly. Since metal during MPC has a higher formability with a negligible spring back effect, the joint strength is much superior that of mechanical crimping. For example, when MPC is applied to join electric wire to the terminal, almost no gap remains between the electric wire and terminal. Therefore, it is possible to produce electric wires having high internal density with low electrical resistance. The automobile industry is promoting the EV car and the demand for high-quality crimping technology is expected to increase in the future. MPE is also a method to expand tube structures from inside to outside parts. MPF has been used for the Lamborghini Huracan car hood production for the first time and the process details have been announced at “Doors and Closures in Car Body Engineering 2014, 5th International Benchmarking Conference 2014”. Although it may be slightly different from the mass production line because of low production volume, but it is a good example of MPF application in commercial car production. Huracan’s hood was formed by a conventional press machine and two character lines were formed by MPF process. In this process, the coil was placed on the bottom of the car hood and dies were placed on the top of it. It means the blank sheet of hood’s car will sandwich between them. A one turn coil is placed only in the part area necessary for forming of the character line. 6000 series aluminum sheet with a thickness of about 1.5mm was used as hood material and the sharp line with radius of 0.1mm was formed successfully using MPF techniques. This sharp line forming cannot be carried out using conventional press machines. Some other companies also use Bmax MPW systems for welding of 3000 series aluminum cap and aluminum tube for automotive HVAC parts or fuel filters. In comparison with MIG welding or laser welding, MPW has a great advantage. Because there is no heat affected zone during welding, such a part with a plastic filter inside can be welded without any damage to it. In Europe, a world famous wire harness manufacturer is considering using MPC techniques for cable crimping. The thickness of the terminal connector can be decreased by using MPC process compared with conventional mechanical crimp processing, and it is thus possible to reduce the material cost. As electric car production and EV automobile industry are increasing gradually, we think the demand for MPW and MPC of aluminum and copper will increase in the future. 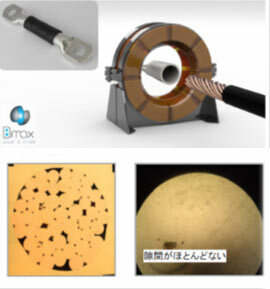 In Japan, car companies are also starting to consider using magnetic pulse technology for their products in mass production but they need to carry out several R&D investigations before that. It is also possible to form delicate shapes on metal surface which are difficult to form using conventional methods. Sharp character lines on the car body and door panel is one example of magnetic pulse technology. The fine and sharp design for luxury packaging is another application which is recently receiving attention. It is necessary to prepare coils and jigs according to the particular shape and type of material parts for each magnetic pulse technology application. Therefore, in addition to the main generator cost, there is a cost to create those parts. Coils and jigs can be designed by Bmax, based on feasibility test and simulation results. However, the customer can also prepare them independently after receiving some know-how. IHI and Bmax provide a complete support for customers. Automation, online QC systems will be the important issue for using MPT in mass production. 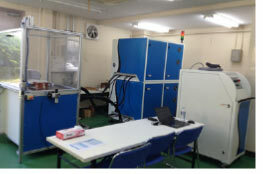 IHI and Bmax plan to offer production lines as a total system including automation as well as support and maintenance..